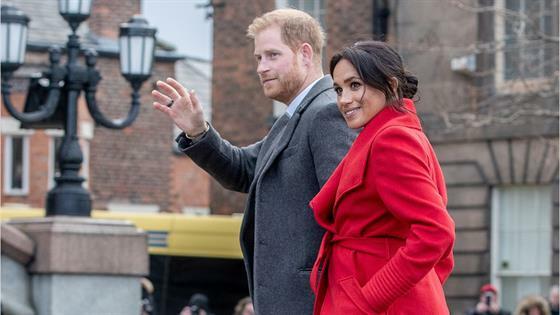 While meeting a group of elementary school children and actors at London's Royal National Theatre on Wednesday, Meghan Markle appeared to particularly impress one of the young thespians, a male student. Kensington Palace posted on its Twitter page a photo of the boy sitting cross-legged on the floor and grinning at the pregnant Duchess of Sussex as she stands and looks at him while cradling her baby bump. The duchess had watched the children perform a short performance inspired by the play War Horse and created to mark the centenary of Armistice Day. "Thank you to the children of Edith Neville Primary School for a fantastic performance @NationalTheatre!" read Kensington Palace's tweet. This marked Meghan's first visit to the Royal National Theatre since it was announced earlier this month that Queen Elizabeth II was passing patronage of the organization to the former Suits actress after serving for 40 years. During her visit, she also met current and former apprentices from the National Theatre's apprenticeship and trainee program. Meghan wore a pale pink knee-length Brandon Maxwell dress and matching blazer, plus strappy stiletto pumps. Meghan is due to give birth to her and Prince Harry's first child this spring.